It seemed entirely fitting that on the evening that brought the extraordinarily rich life of Sir Roger Bannister to its end, Laura Muir should prove that there remains a lofty place within athletics for those who also wish to cure the sick and mend the broken. Unlike the first person to run a mile in under four minutes, the prodigious young Scot lends her medical skills to animals as she nears the conclusion of her veterinary degree. And although she never met one of middle-distance’s true greats, you sense Bannister – who always saw his distinguished career as a physician as his primary calling – would have roundly applauded the manner in which Muir departed the World Indoor Championships in Birmingham last night with a silver and bronze in her bag amid an unfathomably hectic nine months that she trusts will speed her to graduate with honours. Second to Genzebe Dibaba in the 1,500 metres final on Saturday, two days after coming third behind the Ethiopian in the 3,000m, the 24-year-old acknowledged a debt owed to the most Corinthian of spirits. Muir has become a beacon herself, more so that she now has global medals in her collection with an opportunity, surely, to emulate Bannister as a European champion come the summer. Before then, she will head today back into placements, sit exams in May and finally reach the finish line, having been steered so ably by her coach Andy Young who has meticulously sculpted a training programme around his charge’s variable schedule that has remained highly effective. “I think Andy’s given me a few days off this week, which is very generous of him,” Muir joked. No bad thing after the exertions here and before. Despite the end-results, the equation of juggling sport and study has taken its toll, she admitted. If her 3,000m performance was astute, her approach in the 1,500 was potent as she sped past Dutch rival Sifan Hassan on the last lap before her pursuit of Dibaba came up just short. Even that scalp has raised her self-belief still further, Muir conceded. 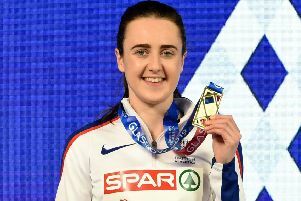 It concluded quite a night for the Burgh of Kinross, with Eilidh Doyle burnishing her already spectacular list of accomplishments with bronze in the 400 metres. The 31-year-old, who was forced to sit out yesterday’s relay final with a calf strain, has rarely run better. A day later, the Scots were together at the track enjoying the spoils of their weekend of wonder.